You’d think that death would stop Pope John Paul II’s good works. You would be wrong. After his death, John Paul has become one of the most popular figures in the Catholic Church, and because of that his name is being attached to miracle after miracle. Pope John Paul II will be beatified in a ceremony at the Vatican, giving him the title of “Blessed” and making him one more miracle from canonization. That means that one more miracle after his beatification, and Pope John Paul II will officially become a saint. It is one of the fastest rises up the sainthood ladder of any person in history. The miracle that pushed Pope John Paul II up the ladder towards canonization was the healing of a 49-year-old French nun named Sister Marie Simon-Pierre Normand. Sister Marie Simon-Pierre, who suffered from Parkinson’s Disease like Pope John Paul II did during his life, says her disease went away miraculously a few months after the death of John Paul II when her sisters at the convent prayed for John Paul II to intercede on her behalf with God; John Paul II died in 2005 after a 27-year reign as Pope and leader of the Catholic Church. 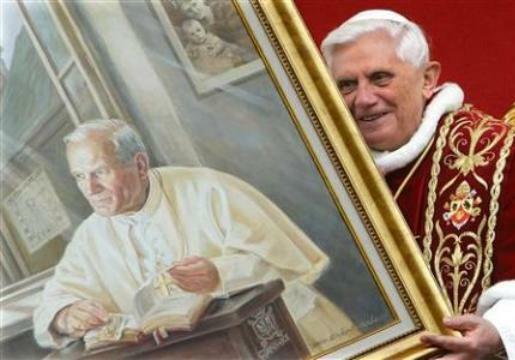 “There is no doubt he will enter history as one of the greatest popes. His legacy, from theological contributions to the work he did that helped end Communism and brought freedom and unity to Europe … is full of tremendous accomplishments,” said Carl Anderson, head of the Catholic charity group Knights of Columbus.